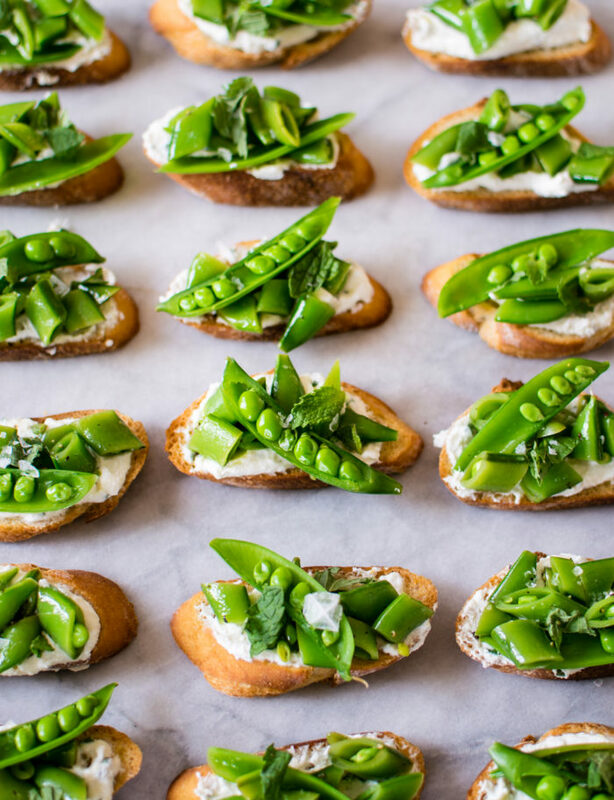 Snap Pea Crostini: Ricotta Pea Kidding Me! It’s spring! I am so beyond excited that it’s finally spring and we can put stupid winter behind us. No offense winter, but after the holidays, you’re just not fun anymore. By the time spring rolls around, I’m always so over dreary, gray Chicago that all want to see are pretty things. I need flowers, green grass, colorful dresses, and beautiful produce. Like, now. Luckily! 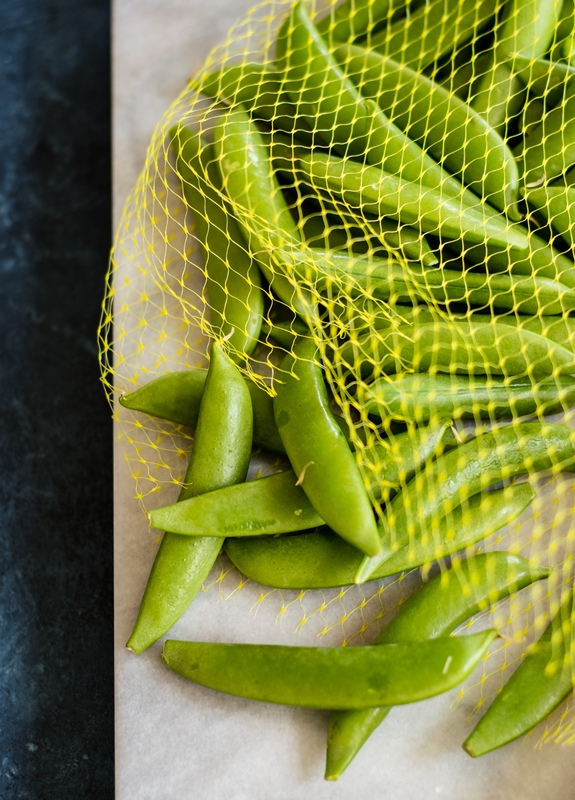 Sugar Snap Peas are in season and they are just as delicious as they are pretty! Listen, I was going to apologize for the completely ridiculous title of this recipe but honestly, I’m not sorry. I’ve re-read it a few times and it’s made me laugh every single time. I have been on cold medicine for most of the week (thanks, winter) so it’s possible that I’m just delirious and the title is not actually that hilarious. Regardless—the title stays. Anyway, this recipe is so tasty and made with really simple, flavorful, spring-y ingredients. It’s also really easy to make! Just like with my favorite bruschetta, you slice up a fresh baguette, brush it with olive oil, bake it for 12-15 minutes until just golden, and then rub each piece with a clove of garlic. This makes the bread perfectly crispy and gives it a nice garlic flavor. While the bread is toasting in the oven you can make the ricotta mixture. Chives and lemon zest add great flavor without overpowering the ricotta. Then, all that’s left to do is give the peas a quick blanch, chop them up, toss them with lemon and olive oil, and assemble the toasts! Some people suggest that you de-string the peas but I think that’s too much extra work. I do, however, suggest that you reserve about 10-15 peas to be split longways (instead of chopped) as a beautiful garnish. See them in the photos?! 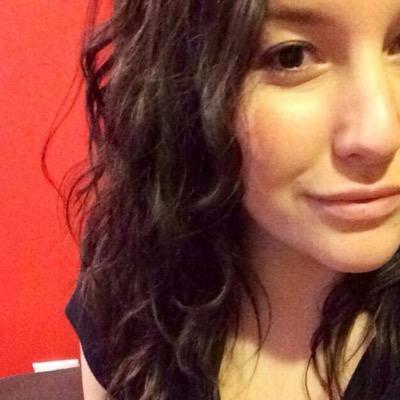 So pretty, right? Totally worth it. Remember to have an ice bath ready before you drop the peas in the boiling water and only boil them for 2-3 minutes. You want them to still have plenty of snap! I can’t wait for you guys to try this recipe. 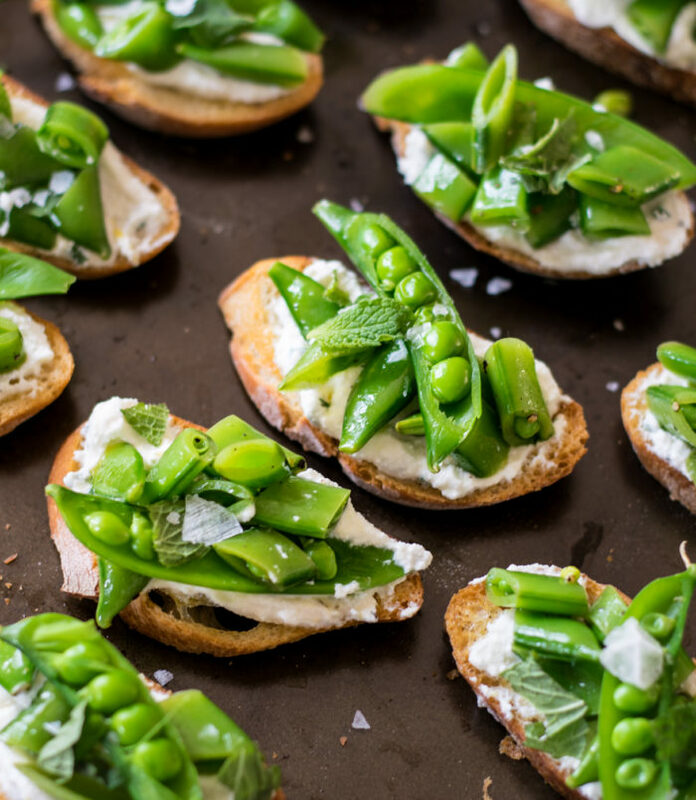 These crostini are the perfect appetizer for Easter, don’t you think? 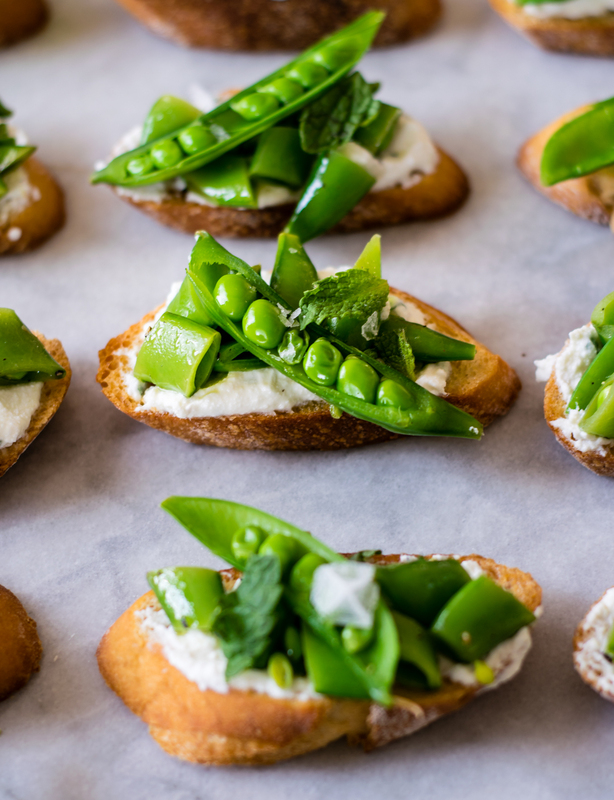 Name: Snap Pea Crostini: Ricotta Pea Kidding Me! Pre heat oven to 375. Slice the baguette, brush each slice with olive oil and bake the breads on a sheet pan for 12-15 minutes or until just golden. When the breads have cooled slightly, rub each piece with a garlic clove. Make the ricotta mixture. In a bowl, combine the ricotta, lemon zest, chives, salt and pepper. Taste and adjust as necessary and set aside. Blanch the peas. Bring a large pot of salted water to a boil and prepare an ice bath. Boil the peas for 2-3 minutes or until bright green and just starting to soften. With a slotted spoon,transfer the peas to the ice bath to stop the cooking. Drain the peas on a paper towel and transfer the majority of them to a cutting board to be chopped. Leave 10-15 peas to be split longways for garnish. In a large bowl, toss the chopped peas with the olive oil, lemon, salt and pepper. Spread ricotta on each piece of bread then top with a spoonful of the chopped peas. 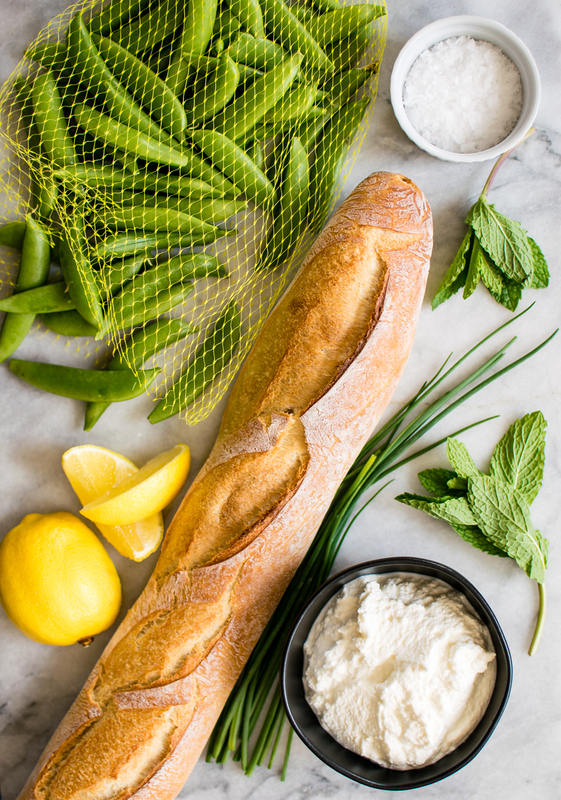 Garnish each piece with one of the peas split longways, fresh torn mint, and flaky salt. Enjoy! And definitely make the "ricotta pea kidding me" joke. Do it.